In this letter Martha Berry tells Mildred that she sent her a chair and table as promised along with twenty dollars to cover freight fees. She tells Mildred that she cannot wait for the term to be over, because they are having too many visitors who only have come to see the new Ford buildings. 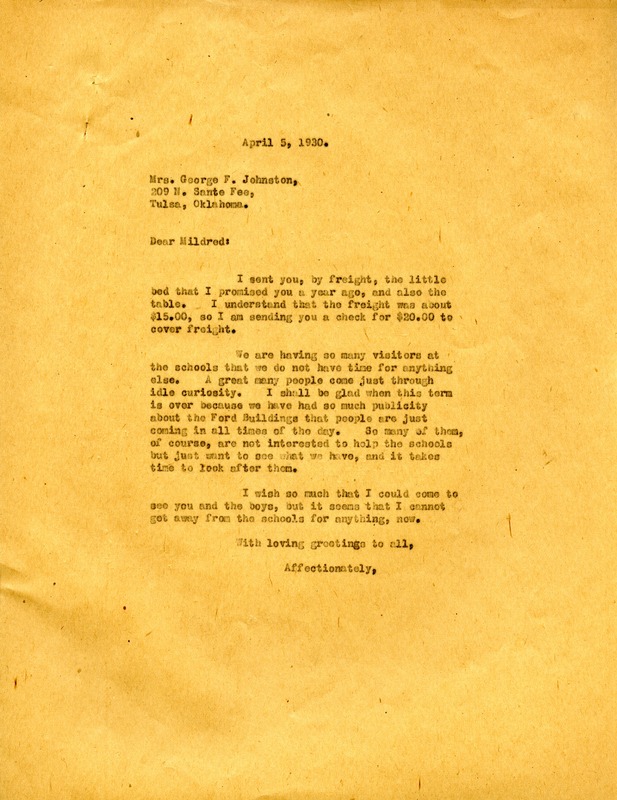 Martha Berry, “Letter from Martha Berry to Mrs. George F. Johnston.” Martha Berry Digital Archive. Eds. Schlitz, Stephanie A., Jordan Brannen, et al. Mount Berry: Berry College, 2013. accessed April 20, 2019, https://mbda.berry.edu/items/show/12996.